Midnighter #1. Steve Orlando- Writer, Aco- Penciller, Aco with Hugo Petrus- Inks, Romulo Fajardo, Jr,- Colors. Everyone loves a mystery! Even a violent vigilante with the ability to see how an opponent will move in a fight before it happens. Midnighter #1 begins with a mysterious break in on The God Garden and the enigmatic Gardener is assaulted. This starts the issue off strong and builds a connection to Grayson where we’ve most recently scene these characters. The scene switches to Midnighter out of costume at dinner on a date with a young man he’s met through an internet dating service. This dialogue is fairly witty and we get to learn about Midnighter which is helpful if you’re not familiar with the character. It doesn’t take long for the restaurant to be attacked by some foreign types looking for political dissidents who are “hiding” in America. This gives Midnighter the opportunity to show how his powers and healing factor work in action. It doesn’t take him long to dispatch the bad guys. We catch up with Midnighter on his second date with Jason- the young man from the restaurant. After a quick demonstration of Midnighter’s mode of travel, the two end up in each other’s arms. The morning after is a bit awkward for both as the young man wants to make breakfast and Midnighter is sort of anxious to get going. 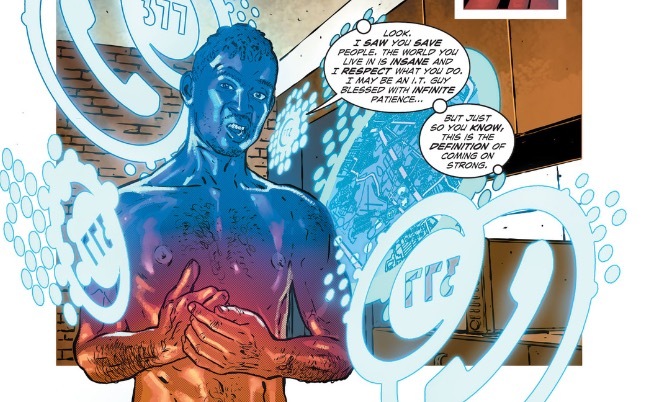 But first he implants him with a SmartMark- a little tech piece that allows Jason to instantly get into contact with Midnighter if he comes across something that Midnighter might need to attend to. This scene ends with the Gardener contacting Midnighter and summoning him to the God Garden. 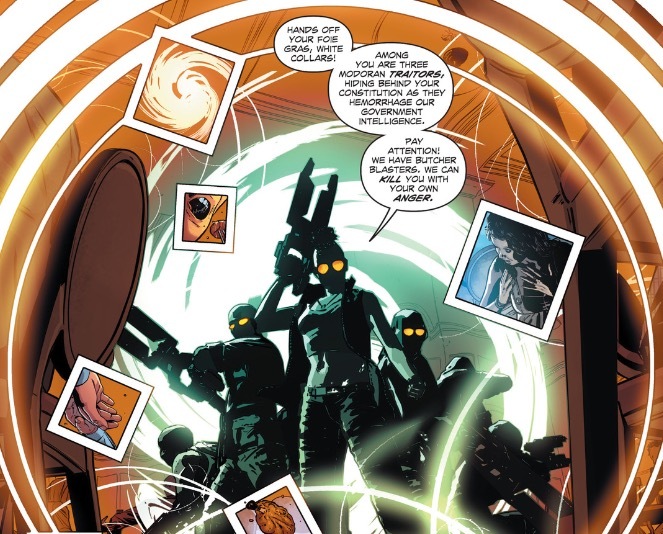 Upon arrival, the Gardener fills Midnighter in on the break in and what was taken- the supposedly erased record of Midnighter’s past. Oops! Orlando does a nice job of introducing Midnighter to the reader in this first issue. If you didn’t know who he was when you started reading, you certainly feel like you understand this title by the end. The mystery theft at the beginning was a really nice way to bring the reader into the book. Aco does a lot of clever storytelling bits as well as making it feel visually connected to Grayson. The downside of learning so much about Midnighter is that once you do, you sort of wish you hadn’t. He comes off as quite pitiable. He doesn’t seem particularly happy, nor well adjusted to his situation, but mostly he doesn’t seem very likable. He’s quite rough around the edges and direct to a fault. And creepy, but not in a good way. If this book had been launched as part of the New 52 it would definitely have been included in The Edge grouping for its approach to sexuality and violence. 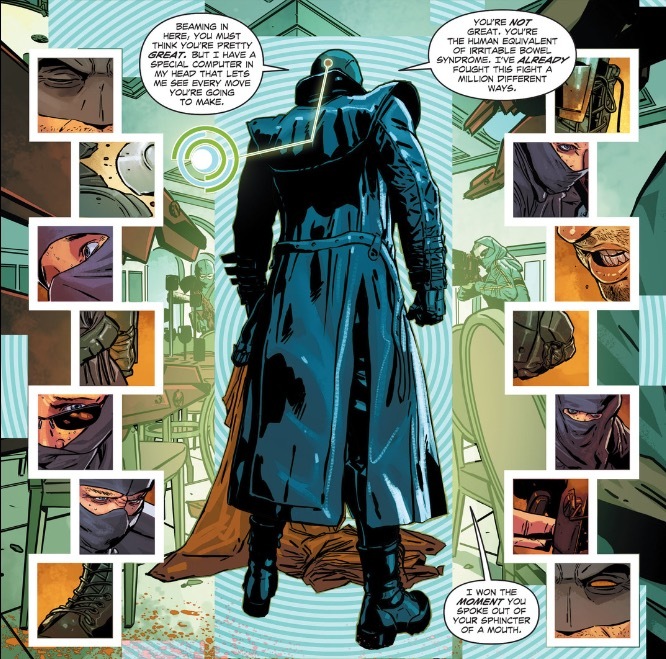 I guess it all comes down to the fact that the mystery of the break in is a lot more interesting than Midnighter himself. The characterization of Midnighter left me cold, but on the whole the issue was decent. It was certainly well executed for a first issue. I think it just comes down to taste. Justice League: Gods and Monsters Chronicles, New Trailer Released!